MonkeyJunk is a new band, but they are winning blues music awards like mad men. New is a relative term, of course, and these are not 3 high school kids that got lucky with a Disney Channel show. Canadians Steve Marriner, Tony D and Matt Sobb have been playing the blues for years, and they have it nailed. Steve Marriner is the singer, harmonica dude and baritone guitar player. His vocals sound much older than his true age, but where he really shines is with his harp playing. He has the Chicago harmonica sound nailed. Guitarist Tony D is a long-time Canadian blues fixture, and brings a lot of road experience to this group. And, he is so incredibly cool that he no longer needs a proper last name. I have heard rumors that “D” stands for “Diteodoro”, BTW. And lastly, there is drummer Matt Sobb. He is a great drummer, who has played with almost every artist and band in Canada. Except Rush. You may have noticed that there is not a bass player listed. There isn’t one. I have seen videos of their live performances, and listened to their album and they do not need one. They are a really tight band, and with their chemistry (and a baritone guitar) they are able to get away with it. 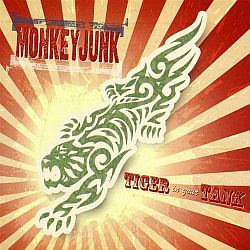 MonkeyJunk’s first album, Tiger in your Tank, was released in the spring of 2009, and is a solid debut. There are 11 tracks, both covers and originals, and they are all very well done. I hear a lot of different influences from their music, but this does not mean that it sounds complicated or unpleasant. It is a true blues album with a good edge, and nothing too fancy. MonkeyJunk’s original tunes really work for me. My favorite track on the album is “Push Comes to Shove” which has a respectable guitar as well as a giant frickin’ organ part. I love the giant organ! Great guitar work also shows up on “Blues for Anna”, and “Small time Evil” is a keeper. Their cover songs are well done too, despite the big shoes they had to fill when they decided to re-do them. My favorites are Leon Russell’s “Boogie Man” and Magic Sam’s “Give me Time”. So, head on over to iTunes and drop 10 bucks on a copy of MonkeyJunk’s Tiger in Your Tank. You will enjoy it for much longer than the two cups of Starbucks that you could have gotten with your sawbuck. heh , I just found this ,Rex . I've done some nights in the Land of Dreams with Tony D . Nice to see this .